Mudras are a combination ofsubtle, physical movements or gestures that alter the mood , attitude and perception, and deepen the awareness and concentration. The techniques range from simple hand mudras to advanced yoga practices involving asana, pranayama, bandha and visualization. On a subtle level, mudras are attitudes of energy flow intended to link the individual pranic force with the universal or cosmic force, uniting the individual with the inner being. Mudra vigyan: philosophy and practice of Yogic Gestures elucidates both the philosophical and practical aspects of mudra. 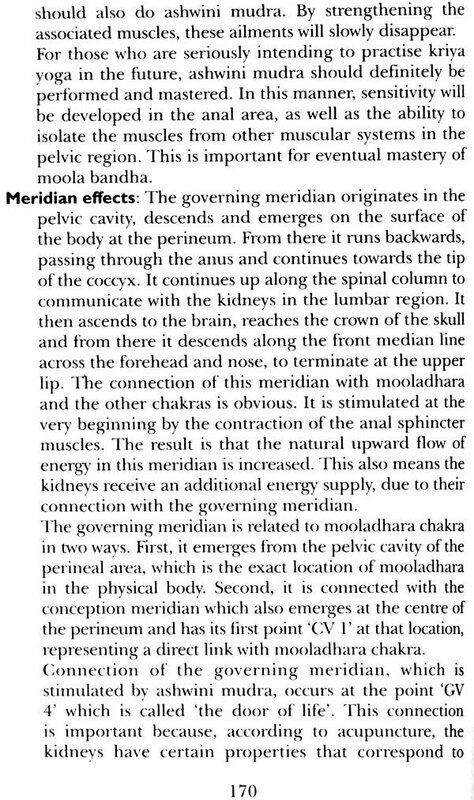 It explain the origin of mudra, the effect of mudra on the body, mind and pranas, and the relevance of mudras for meditation. 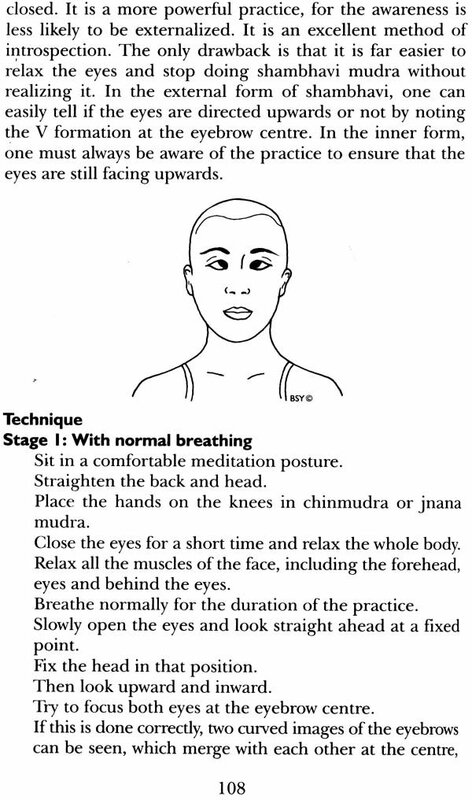 The techniques of classical yogic Mudras have been described in detail, including step-bystep instruction, precautions and contraindications. The benefits and effects of individual mudras have been presented from both a yogic perspective, and from the viewpoint of the oriental system of acupuncture. The technique and significance of therapeutic mudras, sadhana mudras and worship mudras haven also been outlined. A cross the spectrum of creation, sentient beings use their bodies to express and communicate their state of consciousness. A little worm will curl up if it senses danger, a monkey will bare its teeth when it is feeling aggressive, and a dog will wag its tail to convey affection. The higher a creature is on the scale of evolution the more refined will be its bodily signals. Human beings, being on the top of the rung, use the most remarkable gestures to project their thoughts, feelings and states of mind. If they are trying to recall a fact, they may join the tips of the index finger and the thumb at the eyebrow centre; if they are supplicating, they may bring the palms together at the chest; if they are trying to emphasize a point, they may raise a fist into the air, and so on. Then, even among human beings, those with the finest perception will use the most elegant gestures: poets, philosophers and scientists are often seen using their hands in distinctive ways. Eons ago, this subtle aspect of human nature was explored by the-yogi of India. They reached deep into the art of gesticulation, and developed it to the level where they could alter the states of body and mind by simply modifying the way they held their hands. Conversely, when they entered altered states of consciousness, their body would respond with corresponding gestures. These gestures were called mudra. As the insights and experiences developed, it was found that not just the hands, but the eyes, the tongue, the throat, the abdomen, the perineal region, in fact, the whole body could be held in a mudra to create a desired effect. 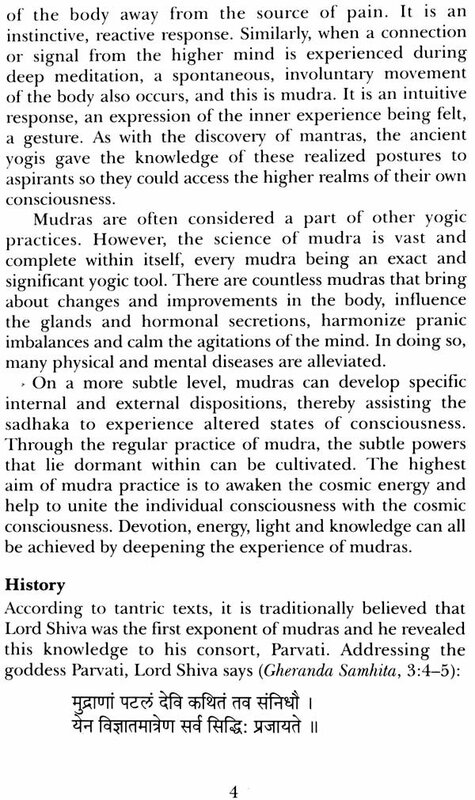 Over the centuries, this knowledge of mudras was consolidated and it became a science unto itself. Mudras came to be used in yogic practices as well as in rituals of worship and dance. Mudra itgyan: Philosophy and Practice of Yogic Gestures brings the wisdom of these ancient practices into a contemporary context. 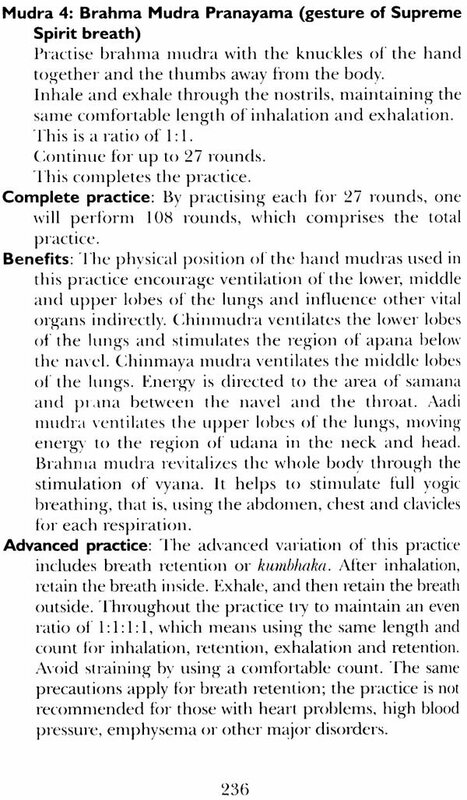 Generally, mudras are introduced as an adjunct to asana, pranayama, bandha and meditation, and the efficacy of mudras as a complete system of sadhana is not delved into. This book offers the yoga practitioner an opportunity to understand and practice mudras as an independent yogic science. The magic of mudras lies in the simplicity of the practices. Although there are mudras that incorporate advanced aanas, most can be performed irrespective of the condition of the body. Yet, they can have such profound impact on the psyche and energy circuits that utmost discernment is cautioned by all yogic texts. It must also be remembered that the subtlety of these effects can be appreciated only through maturity of perception. To be able to realize a mudra, one must develop pranic sensitivity, purification of the body and mind, and drashta bhava, the witnessing attitude. 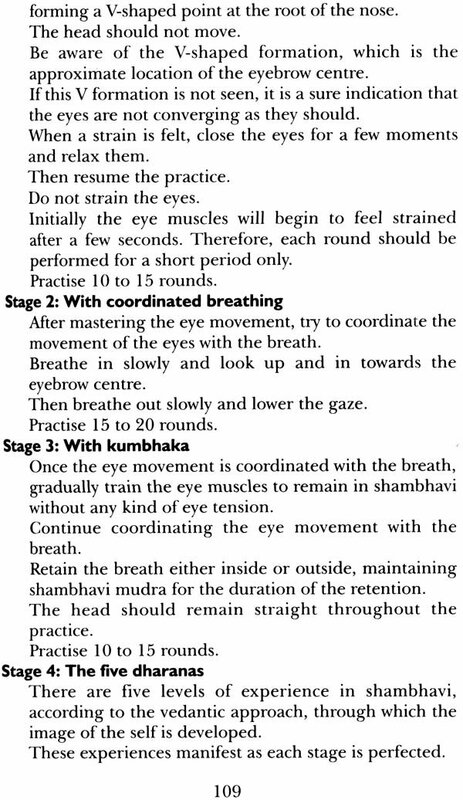 Therefore, it is advised that mudra sadhana is taken up only after practicing asana, shatkarma and pranayama for an appropriate length of time. Mudras are powerful transformative practices that can alter the mood, attitude and perception, and deepen the awareness and concentration. They also have a strong therapeutic effect, and particular mudras are prescribed to alleviate debilitating conditions of the body. At another level, mudras awaken and sublimate energy, and act as a bridge to higher states of mind and consciousness. Mudras are used throughout the various stages of meditation to guide the awareness inwards. They are used to cultivate the first stage of meditation, where connection to the outer world is withdrawn and awareness of the inner world develops. The second stage of meditation, one-pointed awareness, is achieved through the regular practice of mudra. Over time, the mind is trained to remain one-pointed on the focal point of the mudra. When one- pointedness is maintained, through sustained effort, the experience transforms into meditation. This inner process does not occur unless there is constant and steady practice, so that one becomes established in the state of mudra. The purpose of this book is to guide one gradually into these deeper states. Mudra Vigyan is divided into two parts. 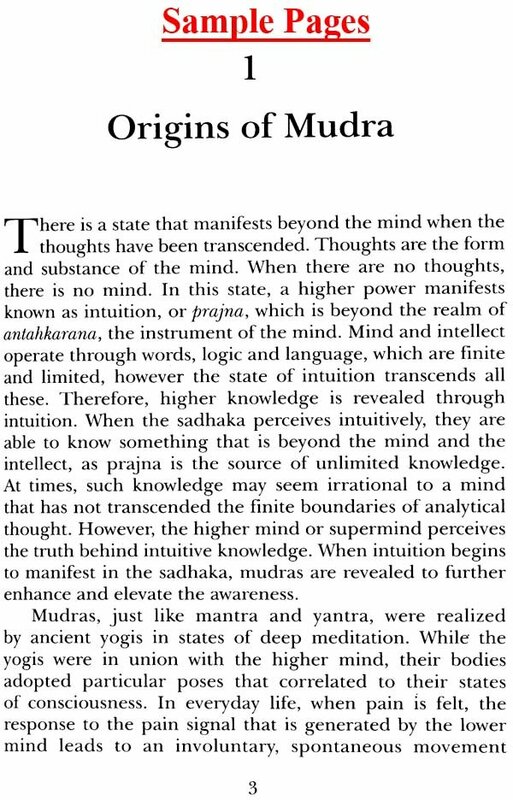 The first part discusses the philosophy and theory of mudra, and elucidates the origins of mudra, the context in which they are practised, the effects of mudra on the pranas, the brain, the endocrine system, the state of mind and the quality of meditation. In addition, the correlation between mudra and the oriental system of acupuncture is presented. 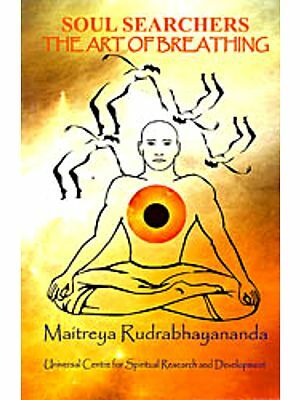 The second part of the book outlines a range of mudra techniques, including classical yoga mudras, therapeutic mudras, sadhana mudras and worship mudras. 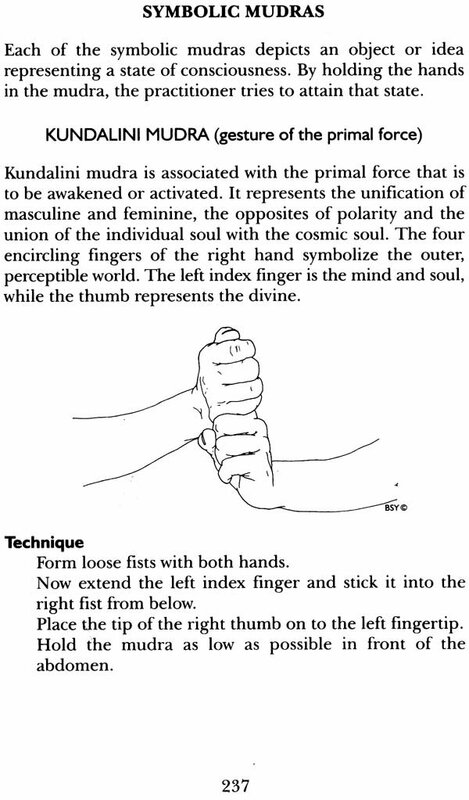 The approach to be adopted for each category of mudras is outlined at the beginning of a chapter, as well as within the description of individual techniques. The classical yoga mudras are delineated in step-by-step practice modules and their respective effects and benefits, precautions and contra- indications are provided. The effects of individual mudras from the point of view of acupuncture theory indicate their therapeutic aspect. 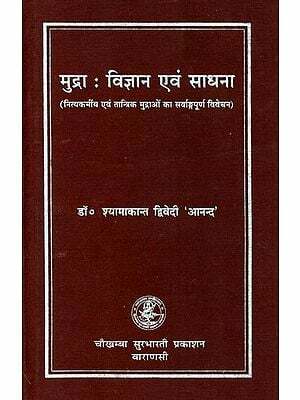 The book is an outcome of the inspiration of the gurus of the Bihar Yoga tradition: Swami Satyananda Saraswati and Swami Niranjanananda Saraswati. Realized masters and siddha yogis, they have revealed the various dimensions of mudras over the years during satsangs and discourses. These talks form the basis of this work. 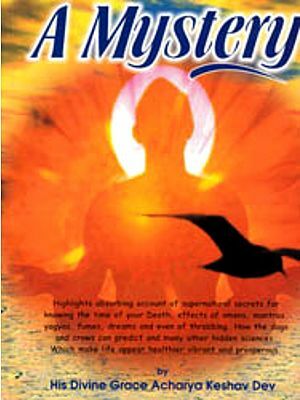 The structure and content was created under the guidance of Swami Niranjanananda, who also clarified various esoteric aspects of the subject.